Last weekend, at our monthly members' meeting-slash-Carolina Challenge Cup viewing party, I had the privilege of sitting down with David Hirshey, the dean of American soccer writers. Hirshey's work is well-known going back to his work covering the Cosmos' glory days for the Daily News. This is the second in an occasional series by ESPN FC columnist David Hirshey, a lifelong NYC soccer fan who covered the New York Cosmos beat. David will follow the creation and trajectory of the newest Major League Soccer team, New York City FC, offering his fan's perspective on the fledgling club throughout its maiden season in 2015. Ever since NYCFC unveiled the marquee face of its franchise in July only to find out in December that, oops, the player actually belonged to a different team, the MLS expansion club has stayed largely under the radar. It has quietly gone about its business of assembling a squad for its inaugural season, all the while hoping that the stench from The Great Transatlantic Frank Lampard Caper wafts back to its point of origin -- across the pond to Lampard's real employer, Manchester City. Judging by the raucous enthusiasm of the 300-some NYCFC fans who packed a Manhattan bar on a frigid, snowy night this past weekend, whatever resentment may have lingered in the wake of the Lampard fiasco appears to be fading, replaced by the intoxicating feeling that normally accompanies new love; in this case, the long-awaited debut of a team that since its inception in May 2013 had been more of a tease than a reality. "It's weird to be rooting for a hypothetical for two years," said Chance Michaels, president of Third Rail, NYCFC's official supporter's group that currently numbers 1,700 dues-paying members among the club's 13,000 season-ticket holders. "But now that it's about to become real we have more important things to worry about than the Lampard mess. "We were pissed by the way the club handled it and we made our outrage known to management. They worked closely with us to assuage our concerns and in the end only a handful of our members asked to have their season tickets refunded. That doesn't mean Frank won't hear some boos when he trots on the field for the first time in July." Michaels was standing in the middle of a beer-drenched mosh pit of NYCFC supporters who had gathered to watch a low-grade Web feed of the team's first official match in the U.S.: a preseason exhibition in Charleston, South Carolina, against fellow expansion team Orlando City. The evolution from a grand notion -- to give the soccer-crazed fans of America's most glamorous melting pot city a team they could support with all the passion that was the currency-in-trade of the once mythic Cosmos in the late '70s -- to a living, breathing entity that New Yorkers can finally embrace in the flesh, is almost complete. Never mind that the current incarnation is the lovechild of Manchester City and the New York Yankees, or that they will wear the colors of the former and play in the stadium of the latter. Finally, NYCFC are on the field but their squad (and their form) will take some time to come together. "Is it an ideal situation?" Michaels asked rhetorically. "Sure, we'd love to be funded by an American and have our own stadium but for now we're just happy to have a professional soccer team to call our own." Just then, a woman who identified herself as being from a Japanese television crew approached to ask Michaels if they could interview him on camera. He had already spoken to a Spanish film crew and the New York Times was waiting in the hallway to shoot a video. But first he needed to take care of some urgent Third Rail business. The club had allotted the group 1,200 tickets for their first game in Harrison, New Jersey, against the Red Bulls or, as Michaels referred to them, "that team across the river." He managed to quiet the boisterous supporters long enough to say "I don't want to see a single seat empty so put your orders in now." Michaels estimates that only about 15 percent of Third Rail members are disaffected Red Bulls fans but because of geographical proximity, they are NYCFC's natural rivals. That was evident by the volley of "Red Bull Out" chants that filled the air, a mocking nod to the expletive-filled cries that famously greeted the new Red Bulls sporting director, Ali Curtis, after he abruptly sacked coach and local hero Mike Petke in his first official move. "Just like I'm sure they derived great pleasure from the Lampard situation, we're happy to stand back and watch the Red Bull supporters have a go at their management," said Michaels, an affable 43-year-old Brooklynite with a British wife, three young children and a well-manicured Alexi Lalas goatee. "I wouldn't be all that surprised if Petke showed up at our first home game." That won't be known until March 15 but in the meantime, NYCFC will open their season a week earlier in Orlando, against the same team they played on Saturday night in what amounted to a dress rehearsal for the official throwdown at the Citrus Bowl, where more than 40,000 tickets have already been sold. The crowd for the exhibition at Charleston's Blackbaud Stadium was considerably less (it was announced at 5,244) but as the digital clock at the bottom of the TVs in the bar ticked down to kickoff, the anticipation among Third Rail supporters was palpable. "Where's Mix?" someone called out, referring to the young U.S. national team player Mix Diskerud who figures to be NYCFC's midfield linchpin ... at least until You-Know-Who arrives. "He's sick," came the response, which was met by a chorus of groans. As the teams came out on the field, the bar erupted with several rousing chants borrowed from English clubs that clearly need to be worked out; it's hard to fit NYCFC into iambic pentameter. 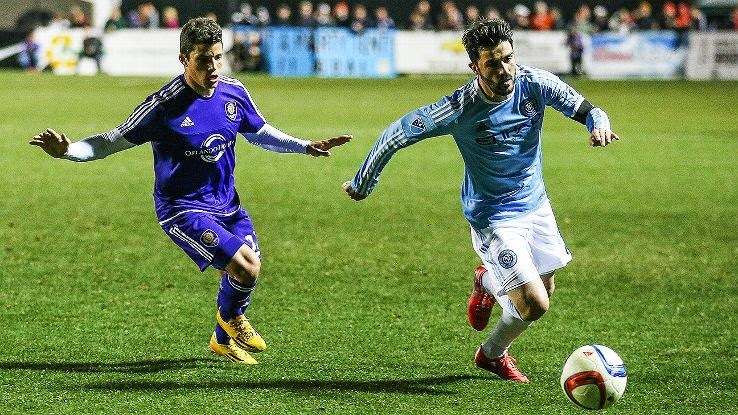 With the possible exception of a Red Bull-Galaxy game involving Thierry Henry and David Beckham, it is doubtful that a MLS match ever had a more illustrious coin flip than the one between Orlando City's Kaka and NYCFC's David Villa. David Villa illuminated NYCFC in a way no other player did. His performance vs. Orlando also showed why he needs Frank Lampard. Here were two former world-class players, club rivals for Real Madrid and Barcelona respectively and for Brazil and Spain internationally, now laughing it up at midfield as the captains (and somewhat aging poster boys) of the two new MLS expansion clubs. It was as if they were sharing a private joke along the lines of "Hey, we're a long way from the Camp Nou and the Bernabeu." It was immediately apparent that the two former superstars were operating at a different level than the other 20 players on the field. Their touch, vision and skill were so superior to their teammates that they would pass into spaces only they glimpsed and the play would break down. To watch Villa, Spain's all-time leading goal scorer, drifting deep into his own half to win the ball was to understand how much NYCFC missed someone of Lampard's pedigree to impose his authority on the midfield. Even at 33, Villa appears a step quicker than his opponents and his technical economy allows him to beat a defender with a simple drop of the shoulder. Which is exactly what he did in the 11th minute when he made space for himself to hit a long-range screamer that crashed against the crossbar before former Galaxy keeper Donovan Ricketts could move. By contrast, Kaka was full of extravagant flourishes, playing with a joyful abandon rarely seen during his last few years in Europe. At one point, he nutmegged two defenders along the touchline only to shoot into the side netting. The Brazilian made amends in the 31st minute, shrugging off a challenge at the top of the box and finishing neatly into the far corner to give Orlando the lead, and cause the Third Rail mob to fall silent for the first time that evening. "That's it," announced a grinning Michaels amid the sudden gloom, "we're disbanding." David Villa revealed his delight at scoring New York City's first goal in the club's inaugural match, a 2-0 friendly win over St. Mirren. Perhaps the supporters transferred a jolt of electrical current to their team in the second half because NYCFC ramped up the energy level, moving the ball with the speed and precision that are the hallmarks of a team coached by Jason Kreis. Not surprisingly, it was Villa who made the equalizer in the 56th minute, leaving the lumbering Orlando center back Aurelian Collin for dead at midfield and finding Khiry Shelton with a defense-shredding through ball. The club's MLS SuperDraft pick from Oregon State did the rest, beating Ricketts with a low shot to the keeper's right and setting off a wild celebration in the bar. I was beer-hugged by a large and excitable young man who seemed oblivious to the fact he had spilled his beverage all over himself. Unlike the scores of other blue and white jerseys with the NYCFC crest on display, he was wearing a replica Man City shirt with the name Aguero on the back. "Who let him in?" I asked Michaels. "A lot of our members have been following clubs in Europe their whole lives," he explained. "They didn't just abandon those allegiances when they started supporting NYCFC." But can a real soccer fan emotionally invest himself in two teams? Has the game reached that masochistic point in the U.S. where you now experience heartbreak with both a foreign and a domestic club? "I don't know about other areas of the country but in New York, you have so many people of diverse nationalities and ethnicities who simply love the sport and want to watch it played well," Michaels said. "I'd like to think that the Third Rail reflects that variety. There are hard-core fans in this room of Barcelona, Real Madrid, Bayern Munich, Man City, Man United, Arsenal ..."
"Which one is the Gooner?" I asked. He smiled. "The same guy who went to the FA Cup final in 2003 for David Seaman's last game as Arsenal's goalkeeper. I'll never forget watching his ponytail bounce up and down on the victory stand." I didn't know whether to laugh or cry. On one hand, I had found a fellow long-suffering Arsenal brother. On the other, it probably means NYCFC is destined for fourth place. David Hirshey is an ESPN FC columnist. He has been covering soccer for more than 30 years and written about it for The New York Times and Deadspin. It was an honor to meet Hirshey, a pleasure to watch the Pigeons play with him, and I look forward to the next installment in his "occasional series" on our club.